Africa United partners today launched a new initiative on universal access to immunization called "Every Shot Counts" at the final of the Orange African Nations Championship in Rwanda. The initiative is the latest focus of Africa United partners - the Confederation Africaine de Football (CAF), the African Union, Gavi, the Vaccine Alliance, the World Bank Group and the CDC Foundation - who first joined together last year to tackle Ebola. immunisation across the African continent. A video highlighting the partners' leadership was premiered at the African Nations Championship final immediately after the pledging ceremony. "We are pleased to lend our support to this important initiative," said President Paul Kagame, President of the Republic of Rwanda. "Ensuring that universal immunisation is effectively achieved for all Rwandans has always been a priority for us; this is, in fact, how we are accountable to the people of Rwanda. Therefore, ensuring that children of Rwanda do not die from preventable diseases is a top priority. We committed to universal immunisation because Rwandans deserve it. I call on every African leader to join us in the fight against preventable child death and to join in the fight for universal access to immunisation." Immunisation is crucial to saving the lives of all children. In Africa, the measles vaccine has reduced measles deaths by 88% from 2000 to 2012, while vaccines have also left the continent on the verge of being polio-free. However, globally, close to 19 million children are still not fully vaccinated with even the most basic vaccines. Nearly one quarter of these children live in Africa which is home to five out of the six countries in the world with immunisation coverage rates of less than 50%. 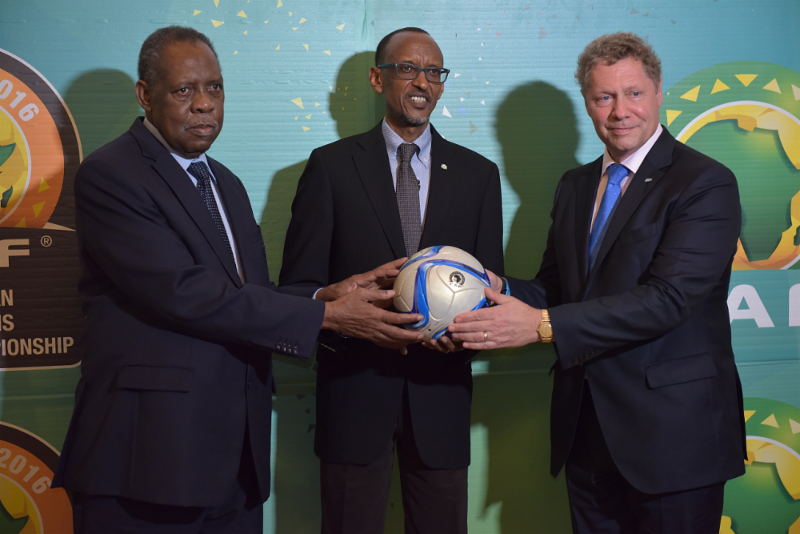 "We see that football unites people from all across Africa and beyond," said Issa Hayatou, President of CAF. "At CAF, we are committed to using the power of football to make sure that our players, future players, and most importantly, our fans, lead healthy lives. We are so excited to announce our partnership with the African Union and with Gavi through Africa United's 'Every Shot Counts' campaign. Together, we will support efforts to immunize millions of children in Africa by 2020." Gavi has joined Africa United partners to encourage the use of all available health services and promote access to routine immunisation. Since 2000, Gavi has helped 40 African countries reach a total of 240 million children with life-saving vaccines. "Immunisation is one of the best investments a country can make in the future of its children. In football, defense win matches. In health, it saves lives and vaccines offer the strongest defensive line against deadly diseases. They protect the long-term health and prosperity of families, communities and nations," said Dr Berkley. "Standing here today among thousands of football fans, I am greatly encouraged by the support of Africa's political and sporting leaders in pursuit of universal immunisation. Football captures the attention of millions of people across this great continent. Now we are all members of the same team as we strive to ensure that every vaccine shot counts." Africa United is a campaign led by the Confederation of African Football, the African Union, Gavi, the Vaccine Alliance, the World Bank Group and the CDC Foundation which strives to achieve universal health access in Africa. Africa United engages political leadership, football stars and cultural and religious leaders in a united effort to improve the health of all Africans. Africa United was originally created and deployed in West Africa by KYNE and Speak Up Africa to rebuild trust in healthcare workers during the Ebola crisis. The campaign reached millions of people in West Africa via partnerships with CAF, celebrity footballers, local media, local and international health authorities. Gavi, the Vaccine Alliance is a public-private partnership committed to saving children's lives and protecting people's health by increasing access to immunisation in poor countries. The Vaccine Alliance brings together developing country and donor governments, the World Health Organization, UNICEF, the World Bank, the vaccine industry, technical agencies, civil society, the Bill & Melinda Gates Foundation and other private sector partners. Gavi uses innovative finance mechanisms, including co-financing by recipient countries, to secure sustainable funding and adequate supply of quality vaccines. Since 2000, Gavi has contributed to the immunisation of an additional 500 million children and the prevention of approximately 7 million future deaths. Gavi, the Vaccine Alliance is funded by governments (Australia, Brazil, Canada, Denmark, France, Germany, India, Ireland, Italy, Japan, the Kingdom of Saudi Arabia, Luxembourg, the Netherlands, Norway, the People's Republic of China, Republic of Korea, Russia, South Africa, Spain, the State of Qatar, the Sultanate of Oman, Sweden, United Kingdom, and United States), the European Commission, Alwaleed Philanthropies, the OPEC Fund for International Development (OFID), the Bill & Melinda Gates Foundation, His Highness Sheikh Mohamed bin Zayed Al Nahyan and Majid Al Futtaim, as well as private and corporate partners (Absolute Return for Kids, Anglo American plc., the A&A Foundation, The Children's Investment Fund Foundation, Comic Relief, the ELMA Vaccines and Immunization Foundation, The International Federation of Pharmaceutical Wholesalers (IFPW), the Gulf Youth Alliance, JP Morgan, "la Caixa" Foundation, LDS Charities, Lions Clubs International Foundation, UPS and Vodafone. The Confédération Africaine de Football (CAF) is an international non-governmental organization and the football governing body in Africa. It is currently running 11 competitions amongst which the African Cup of Nations (CAN) and the African Nations Championship (CHAN). CAF was founded in 1957. It has a membership of 54 National Associations. The headquarters is located in Cairo, Egypt.